With Argentina on the verge of a Senate move on legalizing abortion, women in favor marched, banged pots and made their voices heard Sunday. 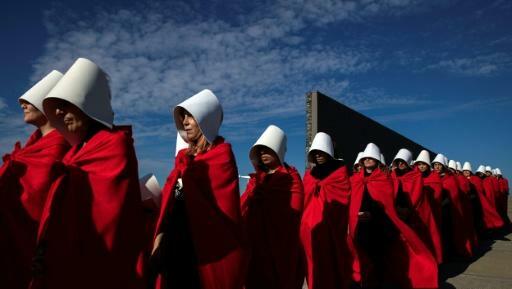 Ahead of Wednesday's Senate hearing, 32 women in Buenos Aires donned the white bonnets and red cloaks worn by women forced into childbearing servitude on the television drama "The Handmaid's Tale," based on Margaret Atwood's dystopian novel. At the Rio de la Plata, they also raised their green handkerchiefs, a symbol of the struggle for legal abortion. It is a thorny issue in Argentina -- which is mostly Roman Catholic and the home country of Pope Francis, the first pontiff born in Latin America. Many in the country believe the church teaching that life begins at conception and that abortion is murder. "Doing this helps us express what is not being heard -- which is that abortions happen. And we need them to be done in a safe place, open to the community, to all women," Bernardina Rossini, one of the marchers, told AFP. Approved by Congress' lower house on June 14, the bill sent to the Senate would legalize abortion in the first 14 weeks of pregnancy and provide for conscientious objection for practitioners, but not for hospitals. In the August 8 vote, senators will have to decide on the version of the text adopted by the deputies. The vote is expected to be tight -- but if a majority of the 72 senators approve the text, abortion will be legalized.